Here it is - The perfect 10' to 20' convertible trade show display you've been looking for! The Executive Tru-Fit tradeshow display features a 10' Tru-Fit Straight display front and center, with two 5' wing panels on each side. This one-of-a-kind 10' to 20' portable trade show display kit allows you to fully customize your exhibit booth. 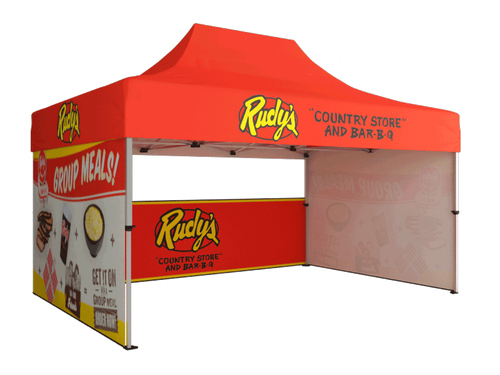 Use all three panels in any configuration to form a 10', 15', or 20' premium trade show display. The stunning Tru-Fit Executive Kit comes fully loaded with custom graphics and LED lights that all fit into a single hard case for transport to and from conventions & events. The hard case also converts into a fully functional podium, complete with a podium graphic for extra brand marketing. Includes (2) single slotted support feet and (2) double slotted support foot for the center of the display! Don't forget to add a monitor mount kit (or two) to create the ultimate presentation at your next trade show, convention, or event.